Young people led the way. Utah is considered a red state, but teenagers there helped lead conservative lawmakers on a path to climate action. 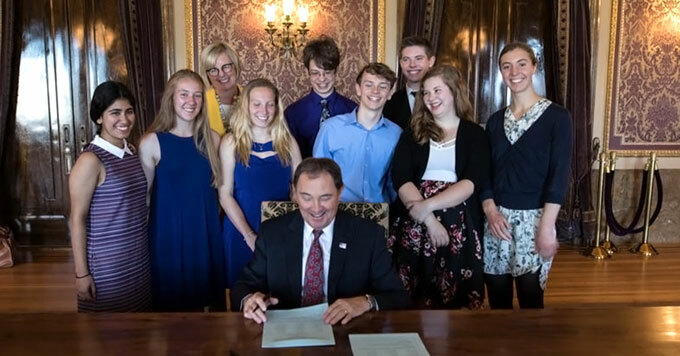 It all started two years ago when Piper Christian and her classmates at Logan High School learned about a resolution the Utah legislature passed in 2010. To change the official stance of the legislature, the students launched a campaign for a new resolution that emphasizes the need for climate solutions. Youth from all over the state joined in and began talking to legislators. The students also recruited businesses and environmental groups to support the measure. And they made an effort to understand any concerns raised by opposing lawmakers. The approach paid off. In March, Governor Herbert signed the Resolution on Environmental and Economic Stewardship. Photo credit: Utah governor’s office.